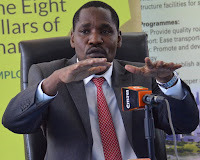 Thursday March 28, 2019-Fresh details have emerged over how Industrialisation Cabinet Secretary, Peter Munya, was called by a top Jubilee government official to silence him over the controversial Sh 21 billion phantoms dams scandal. The Sh 21 billion loot was shared by top Jubilee government leaders who were pretending that they were constructing Arror and Kimwarer dams in Elgeyo Marakwet County. Now appearing before Directorate of Criminal Investigations (DCI) on Tuesday, Munya who is former Meru Governor, revealed that a top Cabinet official phoned him twice pushing him to approve the release Sh 21 billion for Arror and Kimwarer dams. Munya told the DCI in a statement, that he refused to sign because he was new to the ministry and he had noticed a lot of pressure from people he believed had vested interests. After he refused to sign the documents, the top official told Munya to keep the matter a secret and let it be dealt with "within the government". He told Munya to ensure the dam issue did not reach the press. Sources within DCI said it is Deputy President William Ruto who was pressurizing Munya to release the money and pay to some ghost companies.